Message from IUNS President Professor Alfredo Martinez, IUNS President The International Union of Nutrition Sciences (IUNS) was founded in 1946 in London, UK. The vision of IUNS is to promote healthy wellbeing at a global level and a life without malnutrition as a fundamental human right. The persistence of malnutrition (undernutrition and overfeeding), especially among children and mothers and elderly in a world of plenty is immoral. Nutrition improvement anywhere in the world is not a charity but a societal, household and individual right to enhance quality of life and longevity. IUNS has two missions: 1.To promote advancement in nutrition science, research and development of international cooperation at the global level 2.To encourage communication and collaboration among nutrition scientists as well as to disseminate information in nutritional sciences through modern communication technologies. The International Union of Nutrition Sciences also features contemporary global nutrition issues, such as: ·The Global Challenge of Malnutrition (undernutrition and obesity) ·Nutritional education for precision nutrition and also with a public health vision. IUNS is associated to ICSU, WHO/OMS and FAO, and has 18 Affiliated International Societies including the regional bodies FANS, FANUS, FENS and SLAN and has 84 Adhering Bodies. IUNS sponsors several Task Forces. These are currently under review and will be announced online and in the next newsletter. The IUNS Statutes and Rules have recently been revised and were approved by the IUNS General Assembly in October 2017. As the IUNS President for the Council period 2017-2021 I would like to highlight several areas of action including the intention to pay more attention to communicating with Adhering and Affiliated Bodies. Creating a portal where Adhering Body members can access a variety of online nutrition courses for free will be a priority, as will implementing new Task Forces. IUNS Council will seek unrestricted increased funds to extent its activities, and update the current Private Sector Engagement Policy and would like to promote IUNS with specific publications. In addition to these points, IUNS Council will be overseeing the preparation of the 22nd IUNS-ICN to be held in Tokyo, Japan in 2021. The Council formed nine Task Forces (TF) to support the work of IUNS within our 4-year mandate. These were: Risks and Benefits of Iron; Nutrition and Climate Change; Gene-Nutrient Interactions: Knowledge to Action; Capacity Development in Nutrition; Redefining Diet Quality; Prevention and Control of Malnutrition; INFOODS; Traditional, Indigenous and Cultural Food and Nutrition; and Towards Multidimensional Indicators of Child Growth and Development. These TFs organised Symposia during the IUNS-ICN to showcase their work. In collaboration with the Global Nutrition Council of ASN, IUNS organised a Symposium at Experimental Biology (EB 2017) on the theme ‘Nutrition in a fast changing world’, which was very well attended (over 200 persons), with positive feedback. 3.IUNS Secretariat move During the previous Council (2009-2013), the IUNS Secretariat was managed by an international commercial entity in Amsterdam. The yearly service costs were unsustainable. The Council explored other options and IUNS now has an agreement with the Nutrition Society, UK and Ireland, to host the IUNS Secretariat. This new arrangement has substantially reduced the costs. During the tenure of this Council, we made the decision to hold our yearly Council meetings at the IUNS Secretariat Office in London, UK. This has substantially reduced the cost of Council meetings by over 50%. 4. IUNS website revamp Following the establishment of our Secretariat in the UK, it became necessary to revamp our website with the assistance of the Nutrition Society, and a website specialist was hired to redesign and update the information at the website. 5. Re-orientation grant for early career nutrition scientists: Under the IUNS Capacity TF chaired by the President (Anna Lartey) and co-chaired by the Secretary-General (Catherine Geissler), the Council approved the creation of a re-orientation grant to support early career nutrition scientists from developing countries who have completed their PhDs and are starting their careers in their home countries. The objective is to help these early career scientists with seed money to support small projects. Three grants were awarded during the term of our Council to the following: Dr Susan Keino, Kenya; Dr Eliana Meza, Paraguay; and Dr Marie Claire Chamieh, Lebanon. ·In October 2015, IUNS organized a session at the Federation of European Nutrition Societies (FENS) on the theme ‘Global view on food and nutrition situation’, including world trends, climate change and food losses in sustainable food systems.·We also supported the regional nutrition conferences of FANUS, ANEC, SLAN and the Oceanic Nutrition Leadership Program by offering travel grants for young scientists. ·We also supported the regional nutrition conferences of FANUS, ANEC, SLAN and the Oceanic Nutrition Leadership Program by offering travel grants for young scientists. ·The Council extended an existing MoU on scientific collaboration with Unilever until 2017, covering three areas: 1) Scientific evidence around dietary fat 2) Advocacy on the reduction of salt intake 3) Nutrition Capacity-building [ended in January 2018]. These collaborations over the past four (4) years have been successful. 8.IUNS Executive Committee to support IUNS – ICN in Argentina In planning for the 21st IUNS-ICN in Argentina, it became necessary for the Council to form an Executive Committee to work closely with Argentinean Nutrition Society in the planning process with Professor Angel Gil as Co-ordinator. The Council thanks the Executive Committee for their untiring effort in supporting the Argentina Nutrition Society and is particularly indebted to Professor Angel Gil who placed his experience and time at the disposal of IUNS to ensure that we had a successful Congress. General Assembly Decisions Confirmation of Venue and Dates of 22nd IUNS Congress in 2021 The next IUNS-ICN will be in 2021 in Tokyo, Japan. It will be held at the Tokyo International Forum, Japan from 14th – 19th September 2021. Under the IUNS Capacity TF, IUNS joined forces with several Nutrition Societies (American Society for Nutrition, Nutrition Society of the UK and Ireland, Federation of Africa Nutrition Society, and African Nutrition Society) to establish the E-Nutrition Academy. The objective is to support the development of teaching modules on nutrition topics for tertiary level nutrition programmes in Africa. There are plans to expand the programme to other regions in the near future. The General Assembly also voted on the countries that submitted bids to hold the 23rd IUNS-ICN 2025. These were Australia (Melbourne), France (Paris) and the United States (Hawaii). France was elected. Change of Time Frame for Bidding for IUNS-ICN (from 8 to 4 years) The General Assembly was invited to endorse the Council proposal to change the time frame for the bidding process. The rationale for this change is that with advancement in technology, and the increased speed of organisation, 8 years from the selection of a hosting city to the event is excessively long. In some cases, the persons behind the bid had long retired when the IUNS-ICN is finally held. This proposal was to reduce the length of time between the selection of a host Adhering Body and the IUNS-ICN from eight (8) to four (4) years. The proposal was approved by the General Assembly and so at the IUNS-ICN Japan in 2021 there will be no vote to select a hosting city for 2029, this will take place in 2025. Election of Council for the Period 2017 – 2021 Representatives of each of the ABs attending the Congress and proxies for those unable to attend voted on the candidate list prepared by the Nominating Committee from AB nominations. The results of the Council Election plus the transfer of the previous President Elect to President gives the new Council as follows: President: Alfredo Martinez (Spain) President-Elect: Lynnette Neufeld (Canada) Secretary General: Catherine Geissler (UK) Vice-President: V. Prakash (India) Treasurer:Helmut Heseker (Germany) Council Members: Hyun-Sook Kim (Korea) Francis Zotor (Ghana) Andrew Prentice (UK) Teruo Miyzawa (Japan) Ali Dhansay (South Africa) Benjamin Caballero (USA/Argentina) The Council looks forward to its tenure of 2017-2021. Report of 21st IUNS-ICN Buenos Aires, Argentina Dr Mabel Carrera, President of the Organising Committee, Prof. Angel Gil, Director of the Executive Committee, Prof. J. Alfredo Martinez, President of the International Scientific Committee & Prof. Nora Slobodianik, Member of the Argentinian Scientific Committee In 2017 the 21st International Union of Nutritional Sciences International Congress of Nutriton (IUNSICN) was held in Buenos Aires, Argentina. The IUNS-ICN is a four-yearly meeting that has been held since 1946. The 21st IUNS-ICN was jointly organised by the Sociedad Argentina de Nutrición (SAN) and IUNS Council and the congress theme was “From Sciences to Nutrition Security”. 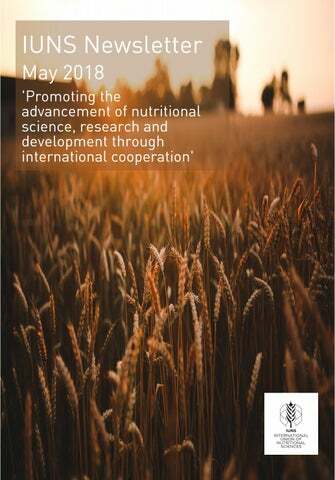 The aim of each IUNS-ICN is to promote the exchange of knowledge in Nutritional Sciences. The scientific programme comprised of 6 plenary lectures, 40 keynote lectures, 116 parallel symposia, 31 sponsored symposia, and 24 satellite symposia. The congress focused on every aspect of nutrition, with a wide variety of topics. Annals of Nutrition and Metabolism have published 2062 abstracts from 97 countries, and 297 abstracts selected for oral communications, presented at the IUNS-ICN. This special edition also includes the summaries of more than 350 selected guest speakers participating in the scientific symposia. The main goal of the conference was to offer a high-level scientific meeting focused on addressing the key aspects of nutrition in a multicultural environment, from state-of-the-art reviews to cutting edge nutritional science information. The sessions delivered the latest investigations and outcomes concerning the impact of nutrition on homeostasis and body metabolism, on dietary intake and nutritional status of the population and the individual for precision nutrition as well on the role of dietary prescriptions in disease management and prevention. The programme also featured translational research orientated to design and implement strategies and approaches to change dietary behaviours and to develop policies, as well as aspects related to public health issues, Nutrition education and climate change, and Food and Agriculture for health maintenance.The programme was led by six plenary sessions from eminent speakers covering all health aspects in the life cycle with integrative views on food security. The 21st IUNS-ICN organisers wish to recognise and thank young investigators and nutrition professionals from low and middle income countries.Travel grants, registration fee discounts, and accommodation reductions for selected young investigators and other awardees were made possible by the contribution from international agencies and the private sector. IUNS granted 73 scholarships to its Adhering Bodies’ early career scientists from universities and research institutes from all over the world. We wish to express our genuine appreciation to all attendants, also to invited speakers and international experts and delegates whose participation and interest produced a successful IUNS 21st ICN for sharing and exchanging knowledge in nutritional sciences for the benefit of the human being. In the current climate of economic burden and financial crisis, it has been a challenge to build a solid Nutrition Congress. Notwithstanding, in parallel, it opens the exceptional occasion to link the multidisciplinary disciplines of nutritional sciences, predominantly basic and applied research activities relating Nutrition and Food with Health. Also, food safety, food production, and environmental sustainability are approached in the programme. Early Career Travel Grants for 2017 IUNS-ICN Professor Helmut Heseker, IUNS Treasurer In 2017 IUNS has sponsored 73 travel grants for early career scientists participating in the recent 21st International Congress of Nutrition (IUNS-ICN) in Buenos Aires, Argentina. To be eligible for a travel grant, the applicants had to be within 10 years of graduation, had to submit an abstract and had to receive the approval from the ICN-IUNS Executive Board for oral or poster presentation as well as a supporting letter from the applicant’s IUNS adhering body, university or research centre. The 261 applications and abstracts from 51 countries were reviewed by the IUNS Council and placed on a ranking list. A total of 72 applications were submitted from young scientists from Africa, 71 from Asia/Australia/New Zealand, 75 from America and 43 from Europe. Depending on the number of applications, up to 3 grants were given to applicants from the same country. The maximum of 3 grants were only given to IUNS member countries in a good standing and regularly paying their annual dues. The young scientists were very grateful to IUNS and made it clear that they would not have been able to attend the ICN without the support of a travel grant. The next call for IUNS early career travel grants will be issued in early 2021 before the next ICN in Tokyo – so keep a note of the date already! Additionally, 7 grants for early career scientists were offered by FINUT (Fundación Iberoamericana de Nutrición). Due to large differences in flight costs to Argentina, grants varied between 2000 and 3000 USD. Overall, 22 grants were given to applicants from Asia/Australia/New Zealand, 18 grants to applicants from Africa, 18 grants to applicants from Europe and 15 grants to applicants from America. During the ICN, a welcome reception was organized for the participants to start and support networking among these early career scientists.